Harvesting basil in the June kitchen garden with my new favorite scissors. There's nothing like a little early December snowstorm to remind you of just how much you took all that fresh basil for granted. When I was getting ready to post my Holiday Gift Ideas for Bakers and Cooks: 16 Favorite Kitchen Essentials (Most Under $25) this year, Joe asked me if I had added anything new to the list. I said no, I'm still loving and using all the same great stuff. But I was wrong. I'd forgotten about my new scissors (and my awesome Oxo food mill). I bought these Fiskars Take-Apart Softgrip Garden Shears ($10.15) back in early spring, and hardly a day goes by when I don't use them at least once in the kitchen or garden. They're called herb & veggie garden shears on the package, but Fiskars also makes identical, general use take-apart shears without the softgrip, and that link is full of glowing reviews from people who use theirs to cut up everything from plastic blister packages and fabric to the fins off fish (some of them for over 20 years). I probably have a dozen pairs of cheap scissors scattered around the farm that I've used for pretty much anything you can think of over the years (I love scissors! ), but now these are the the ones I always want to reach for. The stainless-steel, serrated blades are heavy duty and sharp, but of course what's best about them is that they quickly come apart for easy and thorough cleaning. How cool is that? You can even put them in the dishwasher. If there are gardeners and cooks on your holiday list, these dandy $10 take-apart shears are sure to be a useful, long lasting, and much appreciated gift. If you're buying them for yourself and you don't live alone, you might want to order an extra pair. In fact, I think this is just what my hunky farmguy needs in his stocking this year—maybe with his name written on them. 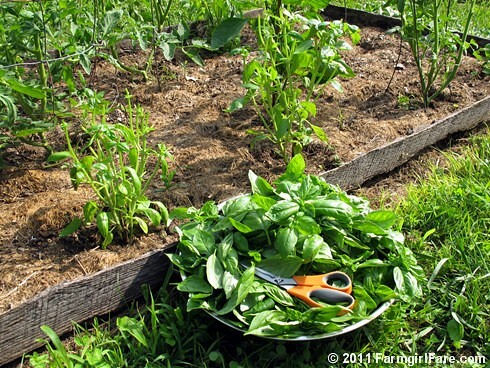 © FarmgirlFare.com, where it's never too early to start planning (and dreaming about) next year's bumper basil crop.